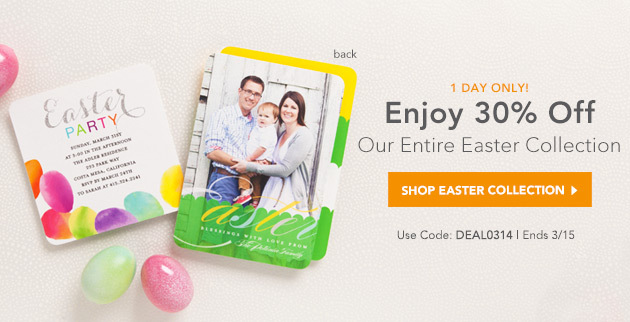 The weekly Tiny Prints Deal of the Day is 30% off the entire Easter collection. This sale is good for 1 day only and expires Friday March 15, 2013 at 9:00am PT. Use coupon code DEAL0314 to save 30%! The weekly Tiny Prints Deal of the Day is 50% off Thank You Cards. This sale is good for 1 day only and expires Friday March 8 at 9:00am PT. Use coupon code DEAL00307 to save 50%! Tiny Prints Deal of the Day this week is 25% off Moving Announcements. This sale is good for 1 day only and expires this Friday 06/08/2012 at 9:00am. Use coupon code DOD0607 to save 25%! The weekly Tiny Prints Deal of the Day this week is 40% Off Photo Gifts. This sale is good for 1 day only and expires Friday 05/31/2012 at 9:00am. Use coupon code DOD0531 to save 40%! The weekly Tiny Prints Deal of the Day this week is 40% Off Photo Gifts. This sale is good for 1 day only and expires Friday 05/11/2012 at 9:00am. Use coupon code DOD0510 to save 40%! 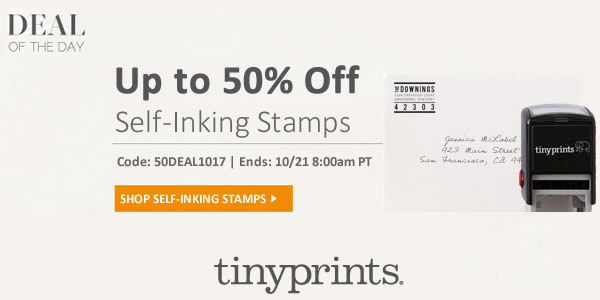 This week's Tiny Prints Deal of the Day is 50% Off Business Cards, Grad Contact Cards and Mommy Cards. This sale is good for 1 day only and expires Friday 05/04/2012 at 9:00am. Use coupon code DOD0503 to save 50%!